The RS-485 port has tri-state capabilities and allows a single pair of wires to share, transmit and receive signals for half-duplex communications. This “two wire” configuration (note that an additional ground conductor should be used) reduces the cabling cost. 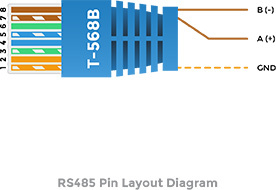 RS-485 devices may be internally or externally configured for two wire systems. RS-485 port is internally configured and thus it simply provides A and B connections (sometimes labeled “-” and “+”). 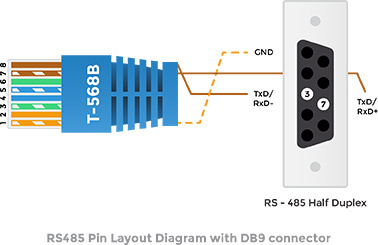 Alternatively A, B and GND wires can be connected directly to the PLC or device without a need of using BD-9 connector as such.